Again a huge comprehension problem (you can change your handle but not your lack of understanding), my request was nothing at all to do with Amy, it was to do with asking someone to prove their contention that faking GPS data is easy to do. I chose a date in the future deliberately so that someone couldn't just grab an existing run off Garmin.Connect and do no work to it. The date is simply data in an XML style file, there is no reason at all it cannot be in the future. I think you just proved how easy it is to fake. Even a smart 5-year old would know to copy from her neighbour. And a 6-year-old would know enough to fudge the data a bit to make it less obvious. Erm, read this http://rationalwiki.org/wiki/E...y_evidence , then read your own post again, then think about why random anonymous people don't believe Amy's claims. The burden of proof is in Amy, not a bunch of reasoned sceptics on the internet. The 7-year-old would probably figure out a Gaussian (noise) massaging, with interpolation between multiple 2:35-ish runs, and at 8 be the head of the UK climate data manipulation crew. Amy claims she ran 520 miles on a treadmill. We don't know how far she actually ran. My best guess is 520 Kilometers, which is still pretty far. So what is stopping you demonstrating this? There seems to be an endemic problem of not understanding that claims require evidence in this thread. Why would you guess 520 km? Isn't it just as likely (if they could fake the data as easily as LRC says, with settings for different treadmills) that she actually ran MORE than 520 miles by a factor of 1.62x rather than LESS? But the official record as submitted to Guinness was 521 miles (as found on her charity webpage (http://www.the53foundation.co.uk), so that's the correct number to cite. No it's not. People say this every time but there are a number of very hard to fake details in a GPS file. For one example, satellite positioning. It's why these fakesters never release GPS files. Obviously they are not that smart. I doubt there where complicated scamming tactics involved. Amy admitted already in interviews that she never knew how far she had run. So the treadmill ended up with 520 Kilometers. Did Amy ran it? I don't know, I haven't seen any prove yet. Belief has nothing to do with it. 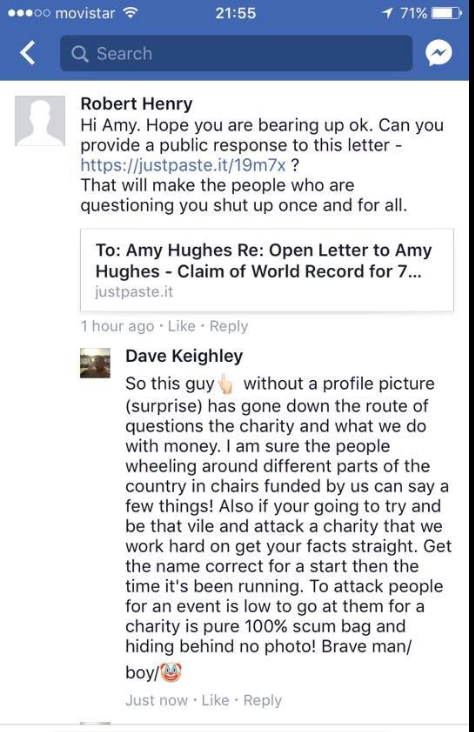 She claims to have done something publicly (run a distance on a treadmill which would make her one of the best multi-day females in the UK) yet she can't provide adequate proof of that, nor the 53 marathons in 53 days. We are not "bullies" on this forum but we are relentless when it comes to checking the validity of claimed running records. Take a look at the famous Robert Young thread if you don't "believe" how thorough we are. Hey Dave. That made me LOFL! You know nothing about endurance running and just posted that on the forum that mocked Killian Jornet for running up Mount Everest at 25 hour marathon pace. Killian is really fvcking slow. Please post more uninformed funny stuff, I'm really starting to enjoy this. How much are you willing to pay. I'll do it. It's more lucrative to hack GPS to cheat at PokÃ©mon Go. I'm highly skeptical, even more so of "for charity" racers. Hell, if my mom ran a marathon for charity, I'd demand to see her Strava. Most courses were short back then and there is no real proof that people actually ran high mileage before GPS and sites like Strava. I repeat, nothing, you want to be believed then prove it, if you don't I'm not bothered. How do I know? Because she's released videos showing she cares.